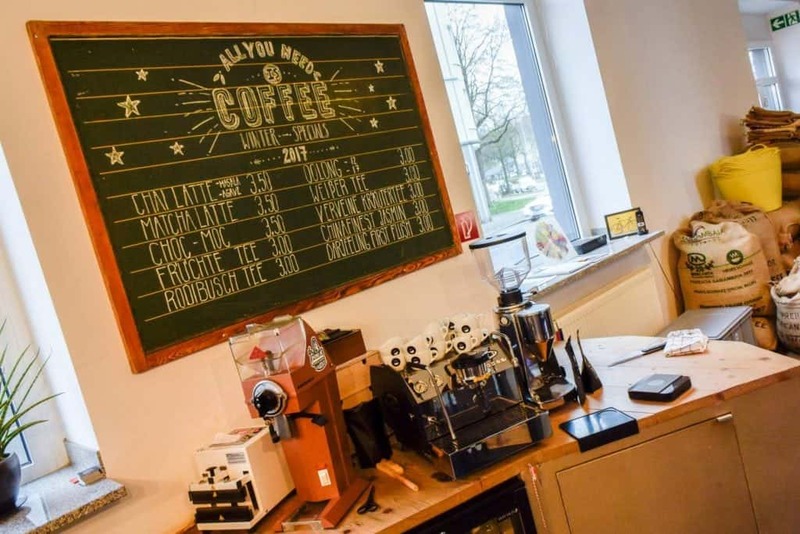 Is Light Roast the New Black for Dortmund’s Coffee Scene? Coal mining, IT research, industrial heritage – how does this triad get together with the topics this online coffee magazine is referring to? 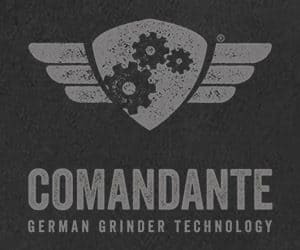 To introduce you to the transfer from old black to new black and of course still under the subject of third wave coffee, this article will take you on a quick journey through time across the decades in the Ruhr-Area, the heart of heavy steel industry in western Germany. 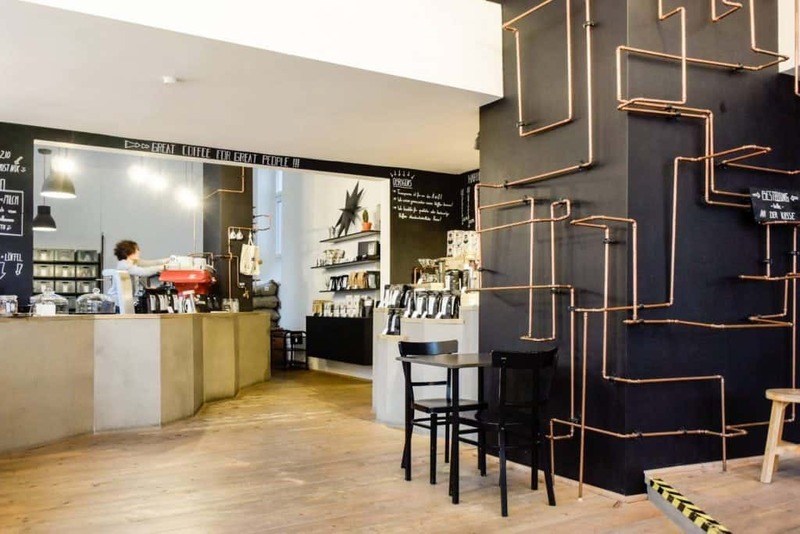 Your destination is the speciality coffee roastery Neues Schwarz (translated “new black”) and its new coffee shop Kaffeebar in the city centre of Dortmund. Up to the 1960s, the Ruhr-Area, a metropolitan area with over five million inhabitants, was mainly focused on stone coal production. Factories for heavy machine production, steel components, cars, etc. had their facilities in the towns along the river Ruhr. The first wave of coffee catered to the hard-working class with industrial production of the commodity, pre-ground coffee, high quantities of which were to be found on the shelves of all supermarkets and in every kitchen. Due to coal crisis, the market developed towards the tertiary economic sector after the 1960s, seeing a growth in the IT branch, research and building of universities. While welfare was on the rise, so was the performance and time pressure on the workers. A demand for quick coffee consumption emerged, while a need for something special regarding coffee appeared, too. 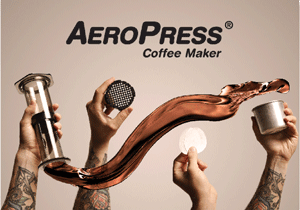 The second wave: Coffee-to-go, Italian-style espresso and pod machines flooded the market. Over the few decades that followed, society diversified and new influences from across the globe broke old conventions in Dortmund and the rest of the Ruhr-Area. The old abandoned factories and mining facilities nowadays denoted as industrial heritage are being reused for the housing of galleries, museums and clubs, just to name a few. Dortmund has been developing a couple of flagship projects to keep the younger generations in town, like the U-Museum being a cultural hub for the creative scene. The development of the coffee culture in the region was a natural part of the changes of the city and the region as a whole. Moving away from the first wave, the second wave cafes remain dominant on the market. 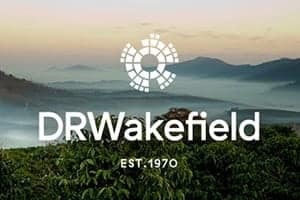 People slowly start to value the great quality and the exceptional taste coffee can offer, although third wave coffee is still a niche. 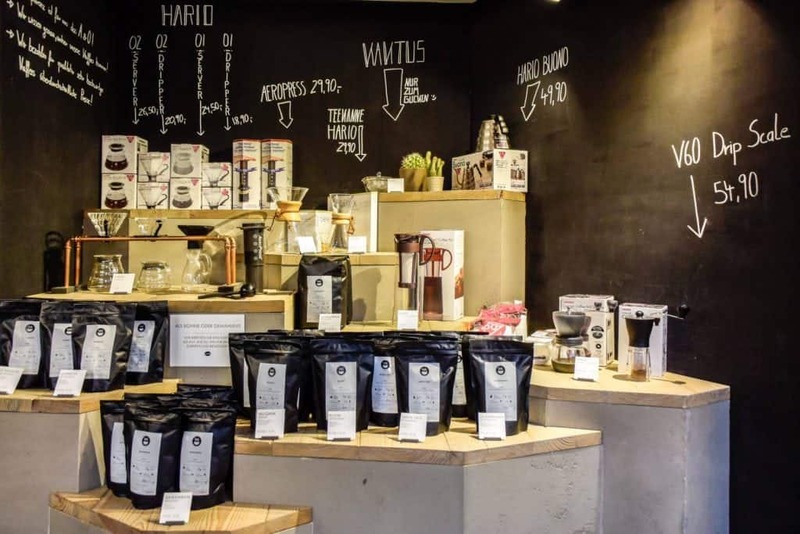 This niche is filled with outstanding speciality coffee roasted by Neues Schwarz, the pioneer third wave cafe and roastery in the Ruhr-Area. 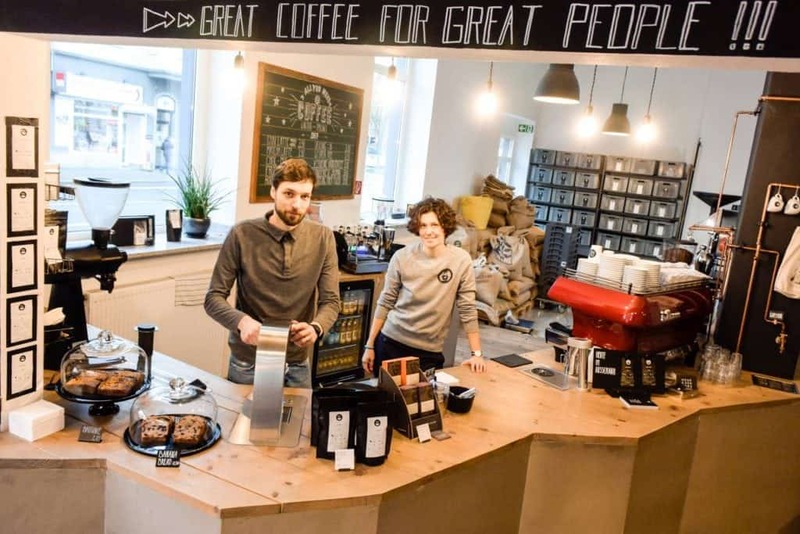 Benedikt Heitmann, his wife, and his brother opened the roastery in March of 2015. 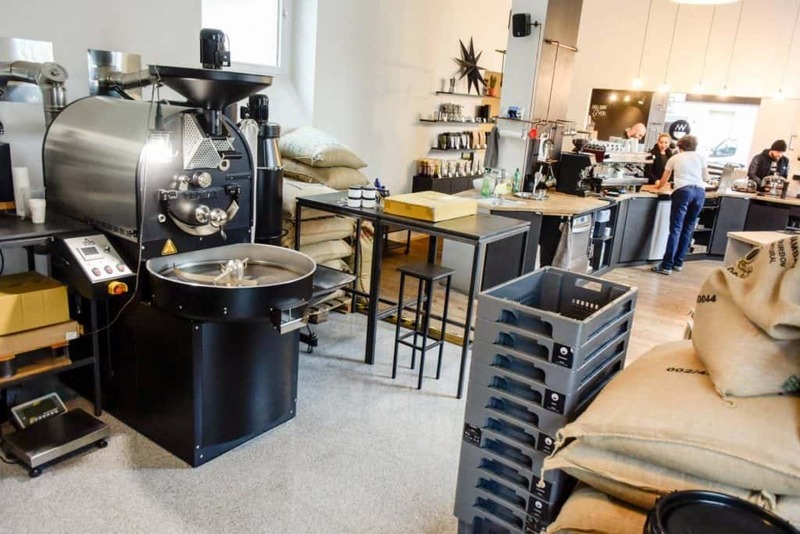 Beforehand Benedikt had worked for two and a half years as a roaster at the well-known coffee roastery Machhörndl in Nuremberg. During this time, while travelling around Southeast Asia, getting inspired by the exploration of the coffee scene in Hong Kong, an idea to develop something of his own back home was born. Maybe another branch of Machhörndl? Rather surreal thoughts of opening his own roastery became serious after having been awarded in a business-plan-contest where the concept for a coffee shop and roastery was laid down. “Now we can’t get out of it anymore”, he thought. Neues Schwarz was born. The name Neues Schwarz refers to the first, second and third wave of coffee. Today the “new black” is making its path forward in the Ruhr area. Benedikt Heitmann and his fellows found a location for their “new black” on Saarlandstrasse, just south of the city centre of Dortmund. Together with an old friend and a family member, both of whom exercise their profession in interior design, a concept for the room, the housing of the roastery and the coffee bar was created and carried out on the owner’s initiative. 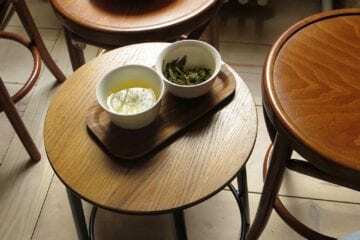 The goal was to invite the visitor to observe the whole journey from green bean to cup. 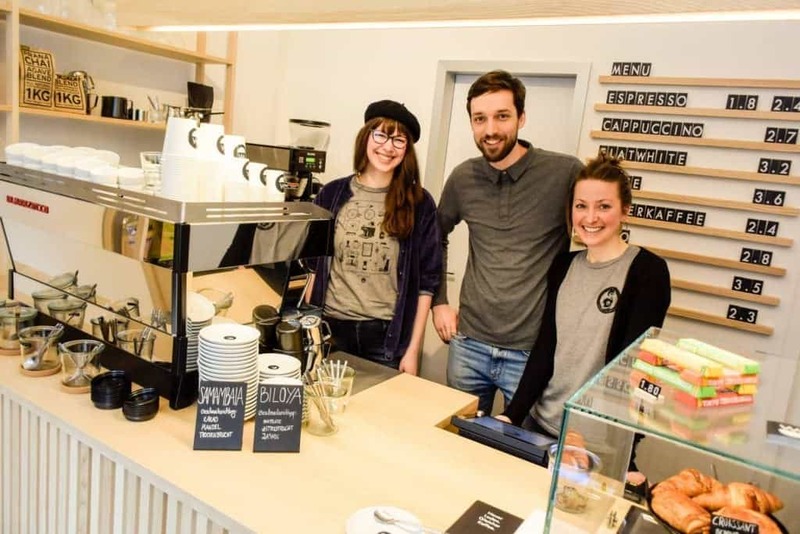 In the spacious headquarter in Saarlandstrasse customers, who had never encountered speciality coffee before, are approached with education in mind. Welcome are also those interested in learning more about this subject and who come over regularly. The cafe and roastery is a place to spend time, talk and indulge in great coffee. Two espresso grinders, a Mazzer Robo for the classic, chocolatey, nutty and heavier option, and a Victoria Arduino Mythos 1 for fruity single origins, are accompanied by a La Marzocco MD80. A special part of the bar is dedicated to filter coffee, which is ground with the omnipresent Mahlkönig EK43. 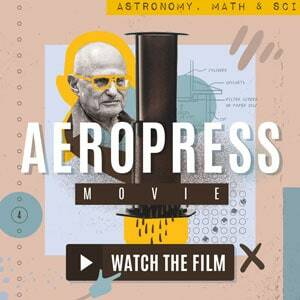 You have the choice between pourovers, AeroPress and Chemex brews. Guest espresso roasts and barista training find their place in another corner of the coffee shop equipped with a La Marzocco GS3 and a Mazzer Major and Mini. The open space of the roastery also offers the opportunity for the team of fifteen to gather, for example for cup tastings. Every month, a public cupping is organized. The plan for this year is to give the visitors an opportunity to take part in brewing classes as well. 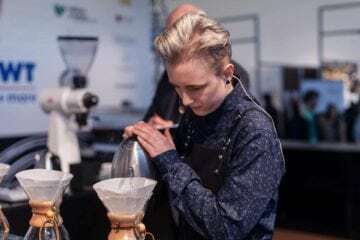 Furthermore, third-place World Coffee Roasting Champion Benjamin Pozsgai trained at Neues Schwarz and can be met there from time to time as an assistant during coffee roasting. Andre Ostheus, one of their past employees, now working on his own project called Reflector Coffee, is preparing himself for the Barista Championship. Neues Schwarz is supporting him with whatever they can offer. 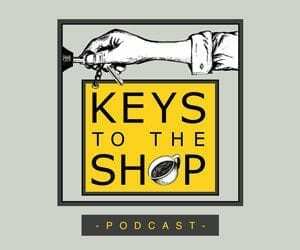 Starting off with five different coffees from various origins, Benedikt and his team were a bit disenchanted at first about people's misunderstanding of the speciality coffee concept. The customers had completely different expectations of the drinks. Despite the customer’s initial hesitation though, they started to appreciate the artisan approach to roasting and brewing. Nowadays, even some of the elderly customers demand light roast pourovers and like them to be served in a glass. Visitors to the roastery are typically people willing to spend their money on something special and are between 25 and 40 years of age. The roastery welcomes the customers to sit-in for a drink, as well as to pop in for a bag of retail beans. Over the past three years, the variety in coffees expanded up to ten different single origin roasts and two blends, either of espresso or filter roasts, while 60% of the espressos are lightly roasted like the Gorbota from Ethiopia. 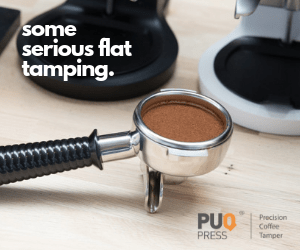 Yet, some customers prefer the classic espresso roast for their filter coffee at home. To fit the demand of the customers in the Ruhr-Area, all roasts are slightly darker than for example what you would get in Berlin. 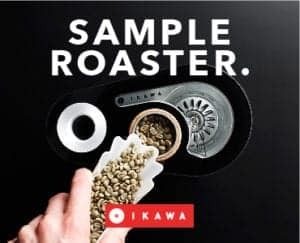 Super light, Scandinavian style espresso roasts would frighten off too many people, but of course, a philosophy is kept to gain the full potential of each coffee, especially the filter options, such as Kenya Mugaya. Mugaya is only available as a filter and that is why you won't find any omni roasts here. Benedikt and his team usually work with green bean traders Trabocca, Nordic Approach or Falcon Coffee, so certain taste profiles reoccur from time to time. But in the next two years, the team plans to visit 3-4 producers at origins. Neues Schwarz is convinced that every roaster has a certain impact on the country of origin, so they work together with producers over a long period of time. 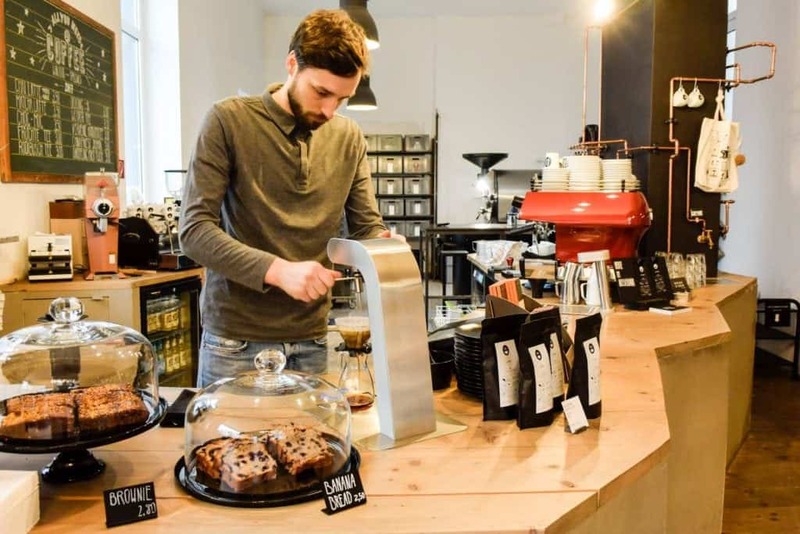 The established coffee roastery and retailer also opened “Kaffeebar”, a new coffee bar in the city centre of Dortmund, in November 2017, with the intention of reaching more people, offering an alternative to the predominant coffee chains of the second wave. 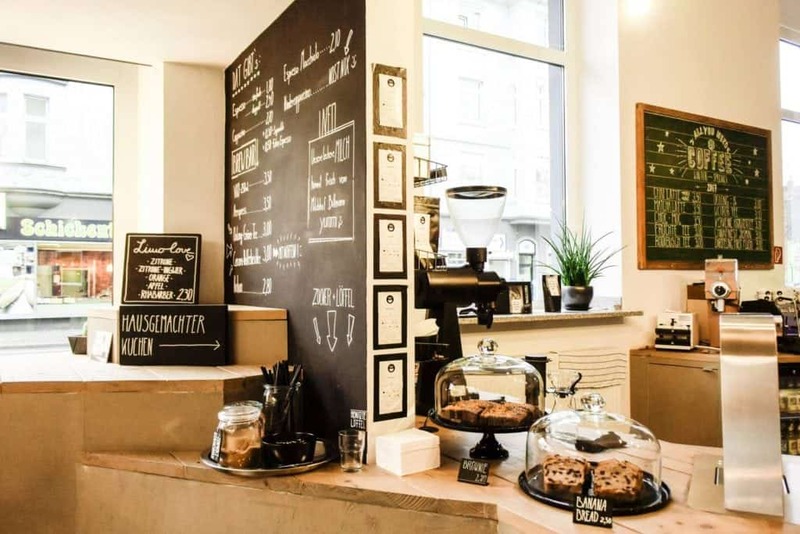 Kaffeebar is the right place for customers who appreciate the individual, yet straightforward service at a cafe and can value a good product. The new shop on the corner of Kleppingstrasse and Viktoriastrasse is much simpler in its approach towards customers. Two shelves with coffee available for retail on the left and right surround the bar located vis-a-vis to one large table. The very clean, Scandinavian style interior is put together using a lot of wood, making it feel quite spacious, despite its limited size in square metres. The credo to ‘keep it simple’ in the new bar is adhered to by using just two different espressos. 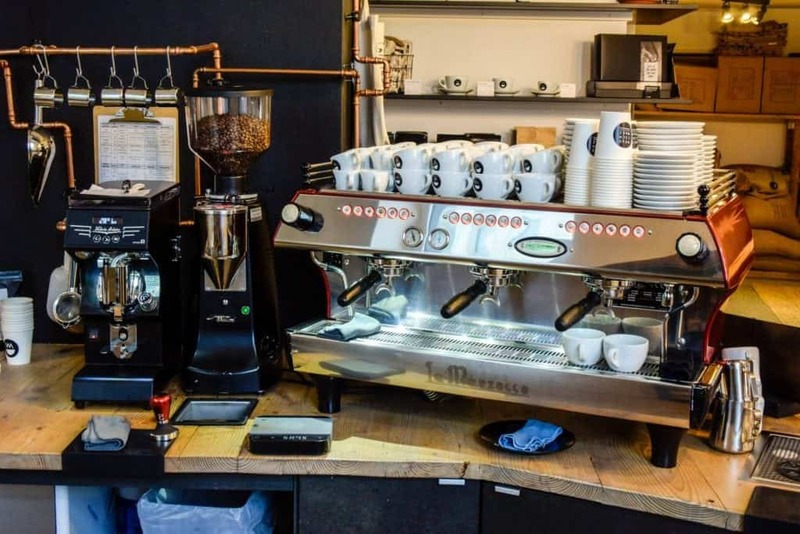 Two Mythos 1 grinders and a new three-group La Marzocco Linea PB with integrated scales are the main machines on the bar, while the filter option is provided as a batch brew. Here, an EK43 is on hand again for the Bunn batch brews. Everything that demands more than three minutes of preparation time is not served, such as teas. 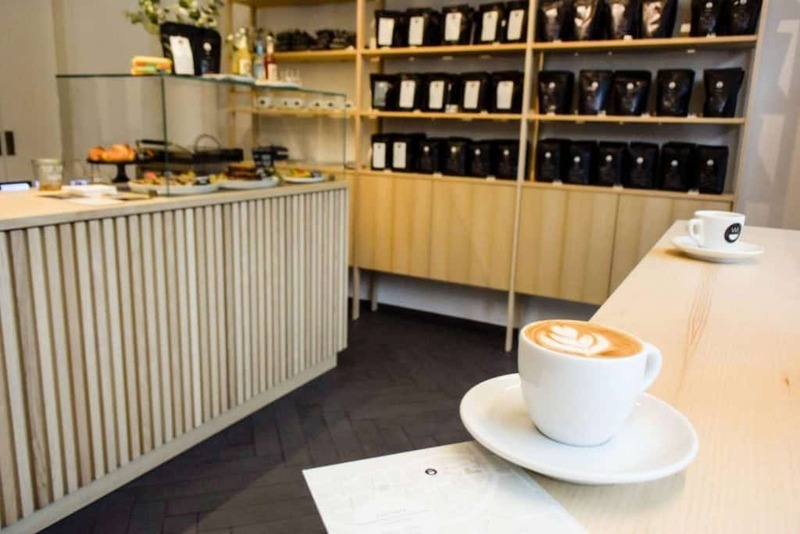 The team at Kaffeebar focuses on walk-in customers and does not want to rush with the usually timely production. Instead, they keep the quality high as one would expect from Neues Schwarz. 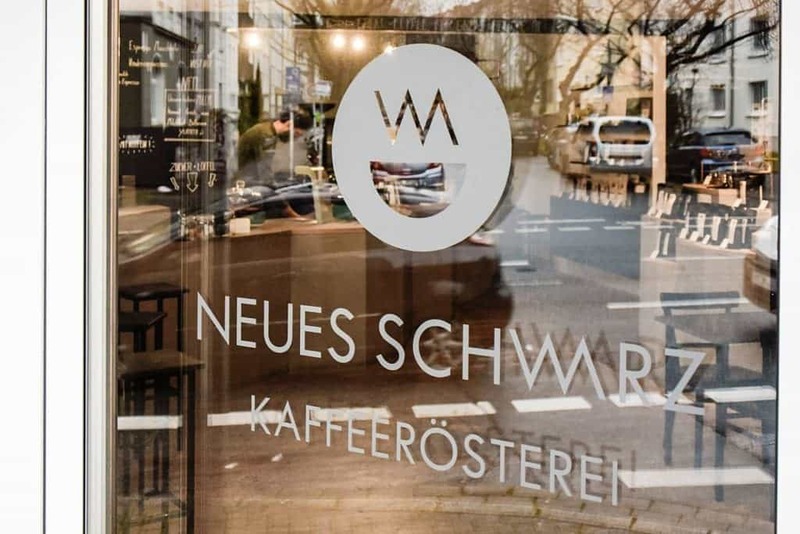 Head over to explore the Ruhr-Area and taste great coffees from Neues Schwarz. 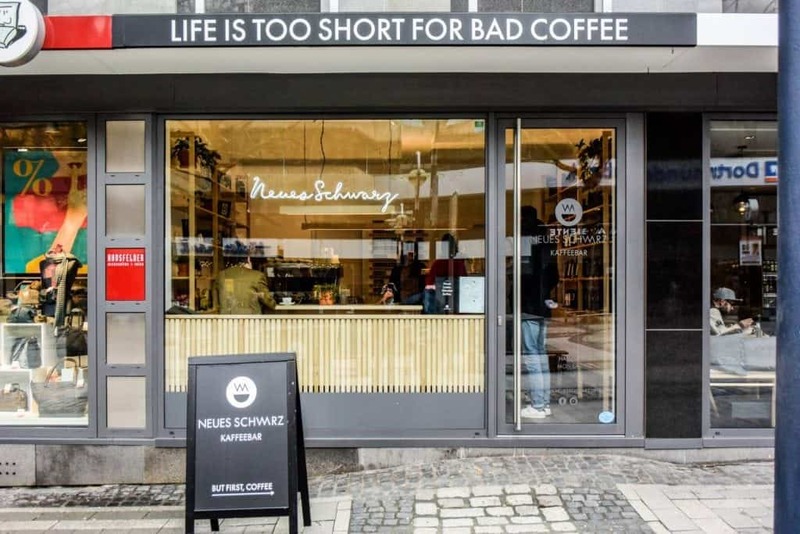 Neues Schwarz is a perfect example of the introduction of speciality coffee to a region which is in a transition from mass consumption towards new values and higher standards. The roastery as an open space and headquarter for training, education and getting together is different compared to the new coffee bar concept, which approaches a larger variety of customers and briefly introduces the third wave of coffee to them.